I have never written about my first born son’s life in his 16 years. For that matter I am not sure i have really written about any of my children as such. Today for some reason I am sharing about my 16 year old son. Levi is autistic and I struggle with autism. It's been a long journey since we had that discovery some 12 years ago. Yet it’s my struggle with autism more than it’s his. If I wrote about the long details I might generate unwanted sympathy. Sympathy is neither my motive here nor is soliciting answers to a puzzling life situation, but rather it is just to give expression to the world from a parent of an autistic teenager. My son is happy and joyful 95% of his days. He is not socially or emotional in conformity of his peers age bracket. He is special, he is simple and he is happy. He probably comprehends far more than what he can express and I desire he could comprehend far more than what he appears to grasp. Our life with our son creates many mixed emotions and it has been this way for so many years. As family and friends see our world many of them want to help fix our situation with ideas and suggestions. All well-meaning, but so few with realistic application. Unless you “live” with autism one will ever really know the full impact of what it is like. Our other 4 children have enjoyed a good childhood & teen years while being a sibling to a challenged autistic brother ( at least I believe that to be the case). I believe they are better people for the challenge and it will widen their compassion in a complex and hurting world. Examples of simple challenges range from soccer to the beach. When it’s time for soccer sometimes one of us might stay home with Levi or we go to the field with him. But often Levi gets bored and/or disengages soon. Then one of us parents needs to leave the field to wait in the van with him. When we go out to eat we might have to leave sooner than others cause when Levi is done he is ready done. eating means just that and skip the social aspect. It’s our reality and we deal with it. 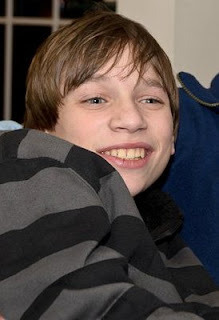 Levi is a special young man and has made positive strides over all these years, but yet he is still autistic. Sometimes I get really frustrated and cry out to God, “if only you would heal him completely and take it all away”. Yes, I've prayed that for literally years each night. It's probably more about me now then it is about Levi. Actually I know it’s more about me then Levi. He does not know he is not normal. Matter of fact his worldview is normal for him. He is very far behind socially, emotionally and mentally cpmpared to others, yet so very happy and joyful that he probably enjoys each day more than most his age and those my age. Sometimes he has seasons and cycles that are easy and sometimes he will not sleep or comply with our life and schedule. We often juggle our life decisions based on Levi and what we know he can handle or believe he cannot handle. Sometimes we leave things early or may decide to not go at all. Sometimes it's a blessing and sometimes it's not. Sometimes we hit it and sometimes we don’t. We have lived near the beach now for 4 years and for several years he has loved the waves and the beach. This past year he went through some phase we could figure out and he could not express it either. It lasted about 9 months. We could not get him near the water. In this season he would not even go near the water or sand. So during that time we went to the beach less often or Levi sat in the van while we took turns staying near him while the others took time in the sun, surf and sand. A few months ago we had a birthday party at a park at the beach. I decided to take Levi for a walk along the edge of the water hoping he might take to it again. After 30 minutes or so with his feet actually walking in the water I thought maybe he will swim again. So back to the van we went to change clothes and back to the water again. Wow, he loved it and I could not keep him out of the waves again. It was like a switch went off and now almost every week he still says “let’s go swimming”. It’s not the time of year to swim as such, but now he wants to go ALL the TIME. I cannot predict his future or ours, but can any of us predict the future? Years ago I taught him to say the Lord’s prayer and now he can say it anytime he wants. At one point in his younger years he would not even talk, now as a teenager we cannot shut him up at times. Progress has happened. What he once could not do; now he can and wants to do. Last week we went to a local church ministry that offered a program called “A walk through Bethlehem”. We waited over an hour just to take the walk through the journey back in time to relive the birth of Christ. We really did not know if Levi would make it through or even like it. It was a risk to go with him. Sometimes we take the risk and other times we don’t want to risk it. I often wonder about other people in society that do not know him or us and how they will respond to an autistic teenager. Those social reactions are what I struggle with far more than what Levi struggles with. He thinks if someone’s face is interesting and looks fun to touch that he can just reach out and touch some stranger. But of course I know he should not and therefore I am always on the guard in public to protect all parties. Now back to Bethlehem: So as we finally walked through the journey we discovered that Levi loved it. Those men dressed in Roman soldier uniforms really cracked him up. I mean every time they walked up and tried to get the crowd to move along with a serious threat Levi would burst into laughter that the rest of the crowd did not see the humor in. Actually, I could not see it either, but I saw that Levi got tickled and could not contain his joy and laughed. Our Walk through Bethlehem became more about enjoying watching Levi then the walk itself. He became my focus of joy instead. We all became enamored with the joy of watching how Levi would keep reacting then what the journey was itself. When the Angel jumped out of a cloud with smoke Levi began from that point on looking all around in the sky for the next angel to jump out again. Huum! Maybe my expectation needs to be looking more too. I love my son Levi. I often feel I have failed him far more than any of my other children. Parenting an autistic child does not come with a manual. I often get tired and feel trapped by the unpredictability of what my autistic son might do or say next. When my frustrations rise and I get selfish and want things to just be “normal’ my precious wife reminds me with two simple words that I need to hear even though I know them well. Those words are: He’s Autistic! To those who have an autistic child or two may God bless and encourage you. You are not alone and never will be. God knows your child by name as do you. Autistic people are different and the spectrum varies so much. To most they MAY NOT BE NORMAL as we refer to as normal. You may even feel trapped by circumstances that do not fit the world around you, but their reality is free in so many more ways than ours will ever be. Enjoy them for who they are and do not get frustrated for who you want them to be. God is still teaching me this long lesson and recently I think i heard that voice again. It's the voice of God saying trust me in all things. Thank God in all things through Jesus Christ our Lord.